Automated punch presses have been punching holes in sheet metal for decades. However, with the stroke control of today’s punch presses and the availability of adjustable length punch holders, CNC punch presses are also being used as mini press brakes. Infinite stroke control allows the operator to make adjustments in the ram stroke in 0.0005” (0.013mm) increments to improve accuracy in forms produced. 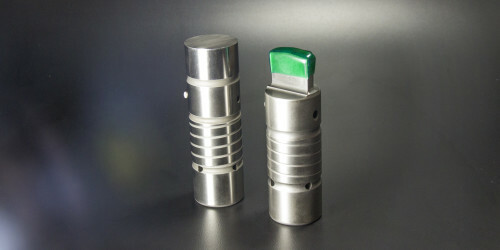 Adjustable length punch holders allow some older model punch presses to use forming tools as well. This allows the operator to adjust the punch holder length where stroke control is not available to improve accuracy of forms. Many manufacturers of punch press tooling also specialize in designing a multitude of forming tools that can be used in these presses. Available forming tools range from basic designs (countersinks and center punch tools) through more complex designs (radius bending and hinge tools). Overall, forming tools are designed with the intent of eliminating secondary operations, resulting in cost and production time savings for part manufacturers. Secondary operations that could be eliminated may include deburring, small tab forming, welding corners or welding additional hardware in place, and in some cases, eliminating the need for additional fixturing. Radiused or curved tabs, multiple bend tabs, shaped embosses, knockouts, extrusions, louvers and etching (or sheet engraving) are among the common types of tools used in punch presses today. Tools that create forms to add strengthening features to sheet metal are not uncommon as well as tools designed to create locking features to secure one part to another. If your punch press has the ability and space needed to create a particular type of form, your tool maker can probably design a tool to produce it. As a leader in CNC punch press tool manufacturing, Mate Precision Tooling produces thousands of special assembly tools on a monthly basis. Depending on the complexity of the tool, some special assemblies can ship the same day as they are ordered. Most other special assemblies ship within 3-5 days. Mate also employs many special applications specialists to assist the end user in tool setup and programming if needed. Whatever your punch press needs are, contact your local Mate Precision Tooling Sales Engineer or call Mate Precision Tooling and speak to an applications specialist to help with your tooling request. John Ripka is an Applications Technician at Mate Precision Tooling.